In the late morning the rock Tbeila emerged from the haze before us. The giant monolith and its twin, once part of the Tifiquirn, were separated from the massif over millions of years by the same process of fluvial erosion which also formed the surrounding valleys. Since time immemorial it dominated the sandy plains. The meter thick layer of silex flakes, broken blades and microliths in its shadow proved that since the arrival of mankind in this valley, the spot had served the Stone Age hunter clans as a settlement site. Here, at the foot of the Tbeila, Sidi Ahmed Laaroussi performed his prayers in the 16th century AD. From the top of the rock which, on clear days, offers a breathtaking view into the valley of the Saquia, his sixteen-kilometer distant tomb can be seen in the hills of Al Dahab with good binoculars. Since those times the Tbeila, or Tbila as the landmark is called by the Aroussiyine, is the place of pilgrimage and most revered holy site of the tribe. Ahmed Laaroussi, whose impact influenced modern Sufism far beyond the borders of the Saquia province, as a Sheik and Murshid was considered to be connected to the divine source of wisdom by a close chain of heritage reaching back as far as to the Prophet Mohamed. According to the Sufi-doctrine the unbroken succession is of great importance to the Sufi master, because an autonomous gnosis of the pure teachings is not possible. In the 11th century AD the Persian physician and mystic Sufi Abu Sa’id-i Abu’l Khair gave an example: “It is easier to drag around a mountain by a hair than to emerge from the ego by oneself”. Thus it is no wonder that the Aroussiyine trace Ahmed Laaroussi’s lineage back to the prophet Mohamed (Alaihi Salam), which is why Ahmed Laaroussi’s full name actually is: Sayed Ahmed Laaroussi Ibn Omar Ibn Sidi Moussa Ibn Yahya Ibn Hassan Ibn Said Ibn Abdul Qadir Ibn Saleh Ibn Umar Ibn Hassan Ibn Ibrahim Ibn Sadik Ibn Abdul-Karim Ibn Abdul Kamil Ibn Ali Ibn Idris Ithnain Ibn Driss Wahid Ibn Abdullah Kamil Ibn Hassan Sebti Ibn Hassan Muthanna Ibn Imam Ali Fatima Zahra Ibn Abdul Quasim Muhamad (Alaihi Salam). 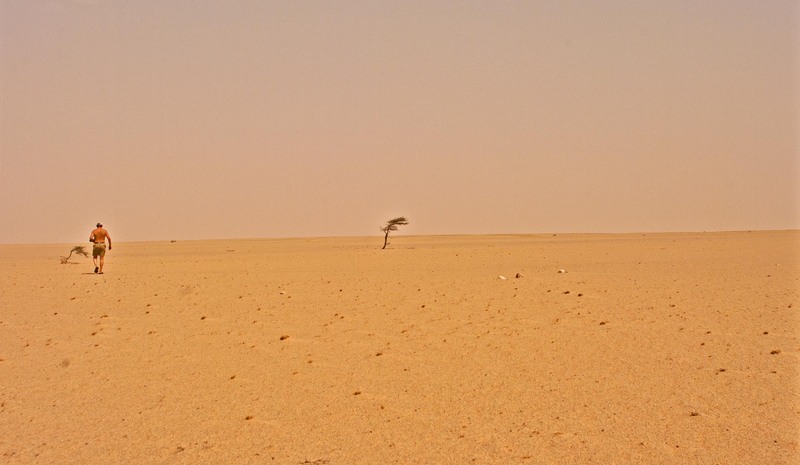 Later in the day, as we reached the gently sloping plain leading to the Qued of the Saquia, the thermometer which Pjotr briefly put on the sand already showed 117 °F. Slowly and thoroughly we searched the new ground following a north-easterly course. The fine-grained Erg, which was loosely covered with a variety of different unsorted gravels, appeared to be a relatively recent surface in geological terms. If one takes the age of the stone tool inventory which could be found on the plain as an indicator, a maximum age of 12 – 18,000 years results. 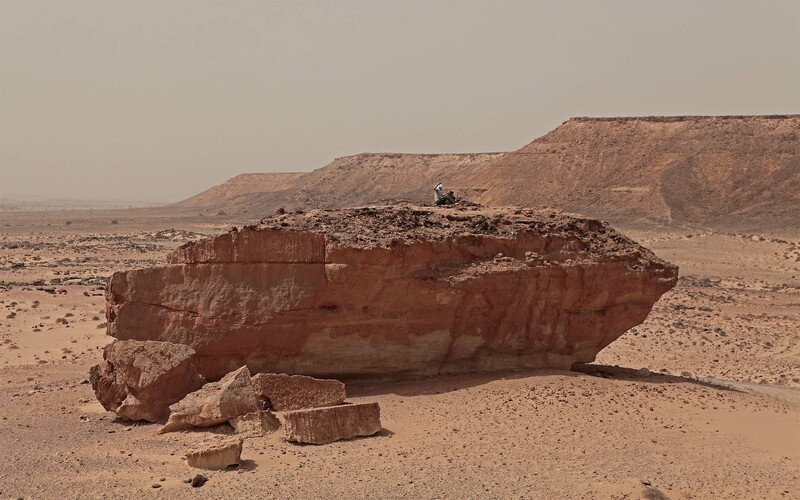 Contrary to the evidence found on the plateaus of the Al Gada, tools older than the triangle-type microliths which are characteristic for the Sahara Epipaleolithic, lacked completely. As the absence of patina on the debris of a number of alluvial fans indicated, some of the gullies leading from the Tifiquirn towards the Qued of the Saquia had been active well beyond this period. We planned a search of two full days for the Saquia valley, one day for the northern half and another for the southern parts. This night we camped in a lateral ravine of the Tifiquirn on the southern fringe of the Saquia valley. Despite the cloudless full moon night a torrid heat stood in the canyon. The Swiss guys spontaneously named the place “Death Valley”. After sunrise Jamal, a young nomad whose camels were just about to descend from the mountains, paid us a visit. From him we learned about the observation of a large and long lasting fireball arcing across the sky a few months ago on an east-westerly trajectory. In the days following the event the usually desolate valley had swarmed with local adventurers. They had arrived on donkey back, mopeds and even bicycles, to search for the fallen thunderstones. We appreciated such enthusiasm and such daring, and given the vast and often kilometer wide sand fields, we were seriously impressed by these dauntless bicyclists who combed the desert for space rocks under the merciless Northwest African sun. Despite our superior means of transport we unfortunately shared their fate and returned to our camp in the late afternoon without success. At sunrise the next morning we broke camp in Death Valley and prepared to bypass the Tifiquirn around its eastern fingers and to continue our search at its southern edge. While waiting on a ridge for the others to catch up, Pjotr suddenly spotted a vehicle in the valley below us with the help of his field glasses. 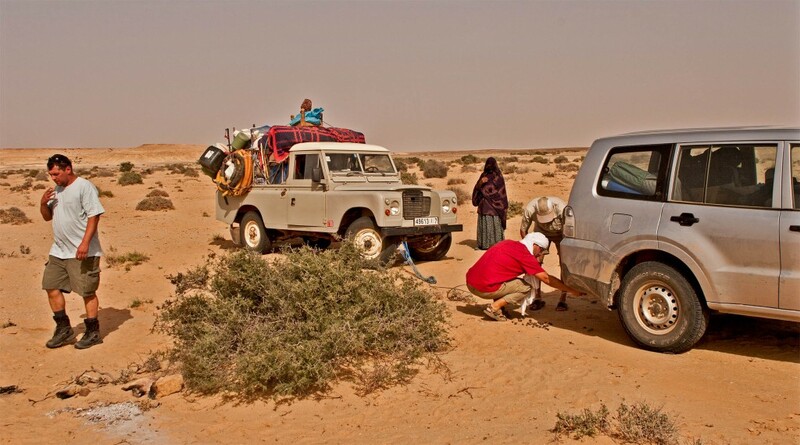 A Tuareg and his family beside a Land Rover pickup, nothing unusual actually. But as the man recognized us against the still low standing sun he started to vehemently wave his arms towards us. We still had more than eighty kilometers to go in order to reach our next destination, and we felt little desire to spend the precious morning drinking tea and doing small talk. However, there was no choice. We had to get down there and check. After all, from our viewpoint we could not exclude that these folks had a problem and needed a hand. So we changed course and headed for the vehicle. Because we did not carry any jumper cables, and push-starting the heavily household-laden car on the sand was out of question, pull-starting the vehicle was the only promising option. This way the brand new steel towing cables purchased in Agadir were appropriately put into service. With a few turns we attached the Series III to our Mitsubishi. Neither the young Sahrawi nor his fully veiled female company spoke any French, Spanish or English. Given the short towing cable and because I distrusted the function of his breaks, I provided him with some technical advice in Arabic while he mentally prepared for the things to come. “Battery is dead”. Attaching the towing rope to the Santana Land Rover. Pjotr started the engine and slowly pushed the pedal. The cable straightened but much to our surprise it looked as if our friend’s truck was nailed to the ground. This could have been because the young lad in his excitement had forgotten to unlock the parking brake. After this was done the tow train moved forward and after just twenty meters our friend released the clutch. His engine started instantly. Enthusiastically he honked the horn for us all to hear that he succeeded. The great black clouds of smoke emerging from the exhaust pipe caused great relief of all parties involved. The driver and his company thanked us overwhelmingly. This brief intermezzo had demonstrated anew, that when it comes to travelling, the desert nomads, first and foremost trust in Allah instead of squandering due care to maintain their transport. There is nothing wrong with that, because experience has shown that a good share of optimism is a wiser counselor than fear and resignation. However, the negligence of their car pool was quite astonishing if one compared it for example, to how dedicated the Tuareg cared for their camels. Evidently there was a major difference in cultural perception between Allah’s creature and the soulless pack camel of modern times. A few hours later we reached the Dayet Hamada. The scorched plain spread before us like an annealed sea of slag. The sorting process of the surface gravel was completed to the greatest extent. The covering layer of lime- and sandstone gravel was composed of a near inactive desert pavement. This spoke for an old age of the surface. 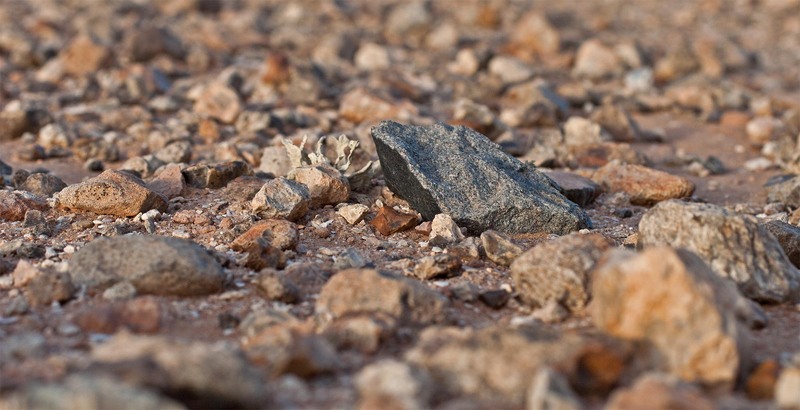 Although there were single islands of vegetation which told of occasional rainfalls, the largely bright pavement at first glance was suitable for meteorite prospection. But as we soon found out, the many chert nodules weathering out of the bedrock and finding their way to the surface limited our prospects to score on this plain severely. It was evident that this ultra-hard material withstood alteration much better than the limestone itself. There were mile-long stretches of flat land completely covered with the black flint stone debris. Anyway, we were used to similar surfaces already from the Al Gada, and so we went about our business without complaining. While the sun was arching across the cloudless Sahara sky we crept along our preset search tracks. At first by crossing the vast plain towards the northwest, and then, as we reached the end of the plateau, we concentrated on an area of approximately fifty square kilometers which was, due to its flatness, perfectly suited for our purpose. The northern part of this new search area was bordered by an unmarked dirt track which ran along the edge of the plateau from west to east. Repeatedly we crossed our own tracks and those of our second vehicle, while on the display of our GPS an increasingly close-meshed web spun across the map. Unfortunately, and much to our regret, until the evening, we had no cause to add a pair of find coordinates to the display. 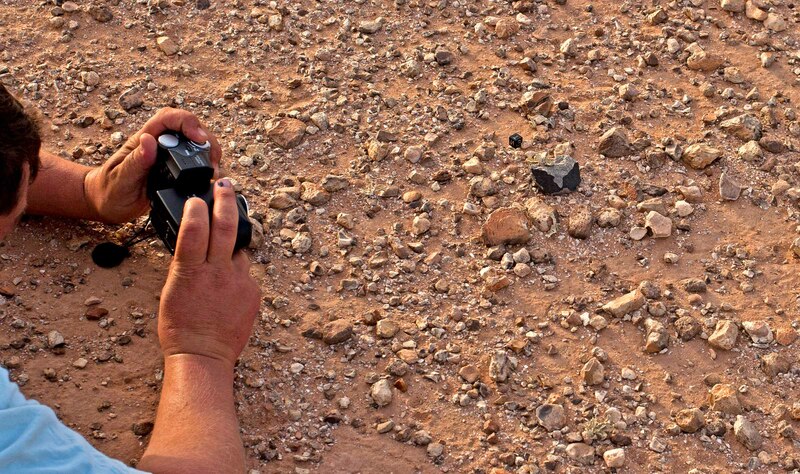 Perhaps a hundred times during the day we had stopped to check potential meteorites. Each time the specimen in question had turned out as a terrestrial look-alike. Together with the terrestrial rocks which were flung out of the car window our hopes of finding meteorites once again dwindled away. When I almost threw a small pebble, which I had just shown to Pjotr, through the shut window, my companion and I decided to give up on it for the day. Completely exhausted by our fruitless efforts in the scorching heat we headed for our rendezvous coordinates. 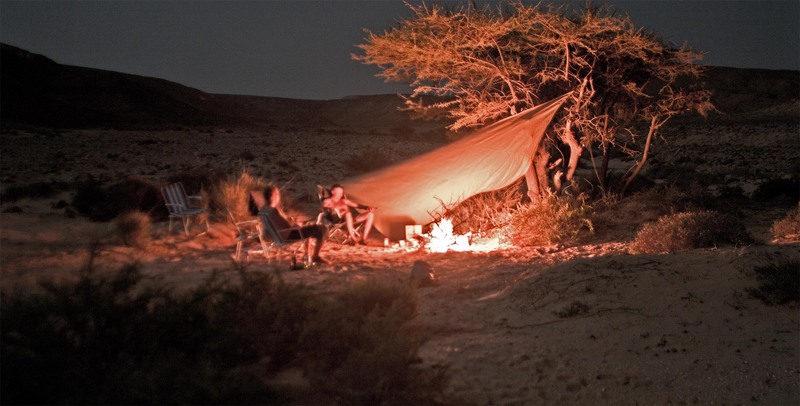 By this time our Swiss friends had aborted search as well and were already busy collecting firewood for the nightly camp from beneath a droughty acacia. We radioed them to join us and without waiting for them to close up, we went straight for the edge of the plateau. There we had located a perfect canyon for tonight’s camp. We did not get far, however, because Pjotr once again had me stop in order to examine the hundredth rock of the day. Marc took the occasion to stop beside me, and through the open window he suggested an alternative campsite in a shallow Qued on the plateau. While Marc and I were negotiating the significant issue where to stay during the night, Pjotr reappeared and calmly remarked he had “possibly discovered something of interest”. Because Marc and I were still a long way from a mutual consent, we continued on our important matter without paying much attention to Pjotr’s unexciting announcement. The latter bemusedly gazed a while to and fro between us before he insisted: “I think I’ve found something very interesting.” This had the desired effect. Electrified I catapulted off the seat and followed Pjotr along our tire tracks. Behind us Marc and Roger jumped off their car. I was prepared for anything, I thought, but nevertheless, what I suddenly saw caught me totally off-guard. Two meters in front of me there was a meteorite that did not only sit embedded in the sediment, something I could have coped with even after six full days of fruitless search, but a meteorite which looked so utterly pristine and without even the slightest trace of oxidation, that it seemed the rock had descended from the sky that very moment. Three steps from the first lay a second fragment. The same picture here: A delicately structured ash grey matrix framed by a pitch black fusion crust. The latter was of such intensity, as if some resourceful prankster had painted the stone with a layer of piano lacquer. Then there was no holding back any more. The tension and frustration of the past days which had kept us down only seconds ago changed into complete rejoicing. The appropriate Indian dances and mutual congratulations were transferred to a place several meters from the find site. With two evidently associated fragments it was after all possible that even more pieces of the meteorite were scattered nearby. Like pilgrims kneeling on the ground in the face of a precious relic, we bent over the meteorites to examine them closely. The fine-grained matrix was composed of finest, in places needle-like, crystals. On closer inspection the monochrome ash grey appeared to comprise interlacing dark pyroxenes and bright plagioclase. Definitively no chondrite. This much was certain. The material was of astonishing homogeneity. No inclusions, no brecciation disturbed the uniform composition. Even after careful inspection neither a grain of troilite, chromite, nor an iron aggregate, let alone traces of rust, could be found. We agreed that we were dealing with a basaltic achondrite, a monomict lithology most probably. Most likely we had found a new eucrite. A remote but unlikely possibility was that we had discovered planetary material. But color, lacking shock features and brecciation and other evidence spoke against a SNC or lunar meteorite. Anyhow, we couldn’t tell in the field. Again we bent over the find. From the dull, shimmering fusion rind distinct solidified flow lines stood out. There was a silky-matte. glossy luster on some parts of the crust, but, as far as we could judge from the meteorites still embedded in situ in the sediment, the iridescent shimmer characteristic of the usually calcium-rich fusion crust of eucrites was not very distinct. Because we did not touch the stones – not yet at least, their size was hard to estimate. Both pieces, however, appeared to be embedded in the soil only slightly. And they both rested on the ground with their fractured surfaces upward. A narrow edge coated with fusion crust was only visible on a single side of the larger fragment and was hard to see from above. It was not until one moved some distance away from the stone that the shallower visual angle allowed the fine strip of black to be seen. Thus the discovery had been possible only from a single direction: the one, from which Pjotr had spotted the fragment from a distance of more than fifteen yards from the moving car. We had searched this very area throughout most of the day. The place where the stones were later found, we had cut it several times close by. Moreover a dense pattern of older tire marks from all directions spun the plateau. It was quite certain that we were not the first to search this old surface for meteorites. Nonetheless, the fact that both fragments had not been discovered earlier was no coincidence. In fact our reconstruction of the find revealed that, because of the tiny strip of dark fusion crust visible, only one of the fragments could actually be seen at all from a distance of more than two or three meters at all. And this fragment could only be spotted from a certain angle. Viewed from all other directions only the grey broken surfaces were visible, and these surfaces perfectly blended into the drab pattern of the surrounding gravel. Because there was only one possible angle of view, the discovery had only been possible at a single position of the sun as well. Only a short time frame late in the afternoon, when the sun already stood low above the south-westerly horizon, allowed its rays to highlight the narrow strip of black fusion crust which provided for a minimum contrast of the stone against the surrounding terrain. As a further peculiarity, both meteorite fragments had a specimen of fruticose lichen abundant on the plateau growing on them. It almost seemed as if the two cosmic newcomers on this plain had tried to hide their alien origin by camouflaging with the khaki-colored plantlet. After all it was thinkable that this kind of mimicry had secured their survival in a hostile environment frequently ridden by meteorite prospectors. In any case it was demonstrated that the sharp eyes of Pjotr Muromov could not be deceived by such a flimsy attempt.